The 2012 Ness City Eagles completed one of the most dominant seasons in recent memory. The Eagles finished 13-0, posted five shutouts, and defeated every opponent by at least 32 points. Ness City won the Division I state championship by beating Mankato-Rock Hills 40-8. Despite last season’s success, the Eagles may not even be considered a favorite to make the playoffs this season. The Eagles graduated seven starters off of that championship team leaving plenty of question marks for this season. Ness City started off 2-0 before dropping their last two games to Victoria and Hodgeman County. The same can be said for last season’s runner-up, Rock Hills. The Grizzlies have battled some injuries and started the season 0-4 under new coach Brock McMillan. So although there may be some new teams in Newton this fall, one favorite should remember how to find Fischer Field. Top-ranked Madison is off to a 4-0 start including solid wins over Division II’s top-ranked Baileyville B&B and a strong contender in Division I in Marais des Cygnes Valley. The Bulldogs won back-to-back state titles in 2010 and 2011. Other strong contenders on the eastern half of the bracket include unbeaten West Elk behind outstanding sophomore back Armando Gomez, Peabody-Burns, and a really talented Osborne team. Teams out west that remain unbeaten are No. 2 Kiowa County behind standout back Trever Powell, Solomon, South Central, Hodgeman County, a young Spearville team, and experienced Atwood-Rawlins County. West Elk (4-0, 2-0 district) – The Patriots edged South Haven 44-42 this past week to move to 4-0 overall and 2-0 in the district. Junior quarterback Tristen Wilson has passed for 400 yards with eight touchdowns and only one interception. Sophomore Armando Gomez leads West Elk in rushing with 544 yards and eight touchdowns. West Elk is attempting to make the playoffs for the first time since 2008. Sedan (2-2, 2-0 district) – The Blue Devils opened the season with losses to Yates Center and Uniontown, but they have bounced back in the past two weeks with district victories over Central Burden and Cedar Vale-Dexter. Sedan is trying to make the playoffs for the first time since 2009. South Haven (3-1, 1-1 district) – The Cardinals rallied from a 36-14 deficit to take a 42-36 lead against West Elk. However, the Patriots scored a touchdown and a two-point conversion to beat South Haven in overtime. South Haven’s J.T. Yunker ran for 265 yards and four touchdowns in the loss, which was the first regular season defeat for the Cardinals in 23 games. South Haven looks to make another run in the playoffs. Udall (3-1, 1-1 district) – The Eagles are coming off a 34-26 win at Oxford. Sophomore quarterback Alex Perez has passed for 382 yards and four touchdowns. Sophomore Dalton Loos is the team’s leading rusher with 285 yards and three touchdowns on 59 carries. Udall is trying to return to the playoffs for the third consecutive season. Oxford (2-2, 0-1 district) – The Wildcats are rushing for 240.3 yards per game, led by the efforts of running backs Daelyn Haskins and Colter Silhan. The two backs have 411 and 394 yards rushing, respectively. Oxford hopes to make the playoffs for the first time since 2006. Central Burden (1-3, 0-1 district) – The Raiders’ only victory this season is against a winless Flinthills team. Central Burden missed the playoffs in 2012 despite having a 7-2 record. The Raiders had made the playoffs in each of the previous three seasons. Cedar Vale-Dexter (1-3, 0-2 district) -- The Spartans opened the season with a 30-6 win over Flinthills. But Cedar Vale-Dexter has lost its past three games by 30 points or more. Freshman Miles Juul leads the Spartans with 13 tackles per game. Cedar Vale-Dexter is trying to make the playoffs for the first time since 2010. Key games: (Week 6) Udall will travel to face South Haven for a game that could decide a playoff spot. Marais des Cygnes Valley (3-1, 0-0 district) – The Trojans are equipped to make a deep playoff run and may challenge to be the East representative in Newton. MdCV was tied with Madison 22-22 in the fourth quarter before falling 36-22. Kaden Vanderpool leads the Trojans out of the backfield and seems to score multiple touchdowns each week. Trey Irey can throw the ball and has a big target in 6-foot-6 tight-end Matt Jones. Expect to see the Trojans in November. Uniontown (3-1, 0-0 district) – Uniontown entered this season with a young roster and not a lot of experience, but the Eagles began by winning their first three games. 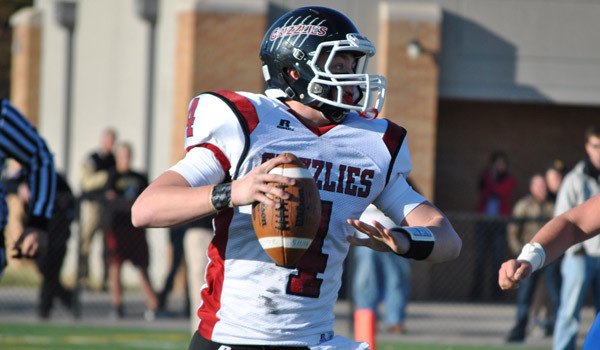 Quarterback Jacob Duffy has directed an offense that is averaging more than 51 points per game. Cole Schafer and John Reed give the Eagles multiple threats in the backfield and Chase Gleason has been a primary target of Duffy in the passing game. The Eagles are looking to reach the playoffs for the first time since 2009. Yates Center (2-2, 0-0 district) – Yates Center has posted two wins in a season for the first time since 2007. The Wildcats, which snapped a 23-game losing streak in a Week 1 win over Sedan, have posted as many winless seasons (6) as total wins (6) since the beginning of the 2004 season. This year’s Wildcats a much improved thanks to a solid senior class led by quarterback Caleb DeNoon. They pushed a solid Waverly team two weeks ago and could challenge for a playoff spot in District 2. Pleasanton (1-3, 0-0 district) – The Blu-jays opened with a 48-0 shutout of Colony-Crest to give first-year coach Trent Stepps his first win. Tough losses to North Andrew (Mo.) and Chetopa followed before last week’s 28-22 loss to Southern Coffey County. Marmaton Valley (1-3, 0-0 district) – Marmaton Valley graduated a lot of talent from last season’s 10-1 team that reached the state quarterfinals. Coach Kent Houk resigned two days before the Wildcats’ opener this season with Chetopa. Daniel Uhlrich, Kyle McAloon, and Derek Scharff have taken over as co-head coaches, but Marmaton Valley has struggled to score points. The Wildcats scored just six points in their first three games before a 56-6 win over struggling Elk Valley a week ago. St. Paul (0-3, 0-0 district) – It’s difficult to see traditionally strong programs fall on hard times, but that’s the case at St. Paul this season. St. Paul has won nearly 70 percent of its games since 2004, but Doug Tuck’s group is battling numbers and a lack of experience this year. The Indians opened with blowout losses to powerful West Elk and Chetopa before an off week and a close loss to Colony-Crest. Key games: (Wk 7) Uniontown at Marais des Cygnes Valley; (Wk 9) Yates Center at Uniontown will likely decide the second playoff spot. Madison (4-0, 2-0 district) – The unbeaten Bulldogs are ranked No. 1 in 8-Man Division I. Madison boasts wins over Baileyville B&B and Marais des Cygnes Valley this season. Owen Reed rushed for 154 yards and two touchdowns during last week’s win over Flinthills. Dustin Sutesman threw for a touchdown pass, taking over for the injured Sage Blubaugh. The Bulldogs also hope running back Dallas Thompson will be able to return from a knee injury. A perennial playoff participant, the Bulldogs will try to make another state championship run. Lebo (3-1, 2-0 district) – The Wolves bounced back from a season-opening loss to Waverly with three consecutive victories. Garrett Holmes and Oakley Baldwin combined to rush for 279 yards in last week’s win over Hartford. Lebo will try to get back to the postseason after missing last season. Peabody-Burns (4-0, 1-0 district) – The Warriors are averaging 52 points per game, while allowing 15.5 points per game. Fred Winsor leads the Warriors in rushing with 580 yards and 12 touchdowns. Quarterback Braxton Kyle has passed for 403 yards and three touchdowns, while rushing for 238 yards and three touchdowns. Centre-Lost Springs (2-2, 1-1 district) – The Cougars are 2-0 on the road, but 0-2 at home this season. Centre-Lost Springs will be trying to get back in the playoffs after falling short in 2012. The Cougars had made the playoffs in each of the previous three seasons. Flinthills (0-4, 0-1 district) – The Mustangs have combined to score only 26 points over the first four games. Flinthills managed only 11 yards of total offense in last week’s loss to Madison. Flinthills last made the playoffs in 2008. Burlingame (2-2, 0-2 district) – The Bearcats opened the season with two wins, but lost its first two district games to Peabody-Burns and Centre-Lost Springs. Burlingame quarterback Jake Carlson has passed for 396 yards and six touchdowns, while rushing for 361 yards and four touchdowns. The Bearcats are trying to make the playoffs for the first time since 2004. Hartford (0-4, 0-2 district) – The Jaguars have allowed more than 40 points in every game this season. Quarterback Mason Esch passed for 212 yards in the loss to Madison. Key games: (Week 9) Peabody-Burns travels to face Lebo in a game that will likely help determine the playoff picture. Osborne (4-0, 2-0 district) – The explosive Bulldogs look to return to the playoffs after a 6-3 season last season. Osborne has a variety of offensive weapons under third-year coach Steve Tiernan, including sophomore quarterback Jake Tiernan, the coach’s son. Jake Tiernan has completed 22 of 23 passes for 442 yards with a 9/0 TD/INT ratio. Senior Kenton Ubelaker, the son of Osborne assistant Ken Ubelaker, has 793 all-purpose yards and 16 total touchdowns. The Bulldogs have outscored opponents 240-74 and lead Eight-Man, Division I in scoring offense. Clifton-Clyde (3-1, 2-0 district) – The Eagles opened the season with a 78-56 victory against Kenesaw (Neb.) and then lost to Axtell, 44-28, before victories of 48-0 against Pike Valley and 44-20 versus Rock Hills. Clifton-Clyde has posted several strong seasons, but hasn’t made the playoffs since 2010. Last week, the Eagles rushed 60 times for 283 yards and five scores. Caleb Gelino had 34 carries for 210 yards and three TDs. Linn (2-2, 2-0 district) – After five straight 4-5 seasons, Linn went 0-9 last year. Linn opened with two straight losses, but then defeated Rock Hills, 24-20, and beat Lakeside, 48-0. Against Rock Hills, Linn trailed 20-16 at halftime, but scored the lone second half touchdown in the third quarter. Senior Brett Peters rushed 34 times for 207 yards and a score in the victory and has 430 rushing yards this season. Wakefield (2-2, 0-1 district) – Wakefield has posted some quality wins with a 52-14 victory against Little River and a 26-20 win versus Centre-Lost Springs. However, Wakefield has had difficulty against ranked opponents in the last two weeks against Solomon (74-52 loss) and Osborne (58-12 loss). Junior Keenan Westerman has completed 25 of 59 passes for 447 yards with a 5/1 TD/INT ratio. Sophomore Zack Melius has 60 carries for 452 yards and 11 TDs. Pike Valley (0-4, 0-1 district) – Pike Valley has struggled greatly after it earned the district runner-up slot last season. They have played the classification’s third-hardest schedule, according to preppowerindex.com, and taken losses to St. John’s-Beloit (45-14), Thunder Ridge (52-0), Clifton-Clyde (48-0) and Lincoln (72-50). Pike Valley has a young team with a sophomore at quarterback and two sophomores, a junior and another sophomore in its top rushers. The Panthers’ 17-player roster has six seniors, but they are listed as linemen/ends. Mankato-Rock Hills (0-4, 0-2 district) – Mankato-Rock Hills has taken a big fall after it finished as Eight-Man, Division I runner-up last season. Under first-year coach Brock McMillan, the Grizzlies have been fairly competitive in all of their contests and haven’t lost any game by the 45-point rule. The last two weeks, Rock Hills has lost by four and 24 points. Junior Joel Broeckelman has played in just two games because of injury and has 25 carries for a team-high 174 yards and a TD. Lakeside-Downs (0-4, 0-2 district) – Lakeside has opened with four defeats, three of them by the 45-point margin, under second-year coach Kody Tegtmeier. Last week, Lakeside trailed 34-0 at halftime and then allowed 14 third-quarter points in a loss to Linn. · Solomon (4-0, 0-0 district) – The undefeated Gorillas have scored 146 points in their past two games. Mason Demars has rushed for 578 yards and 10 touchdowns, while Mark Aylward has rushed for 555 yards and 10 touchdowns. Solomon advanced to sub-state last year. · Canton-Galva (3-1, 0-0 district) - The Eagles won their first three games before falling 50-20 to Peabody-Burns last week. Quarterback Cody Savage is trying to break his older brother’s career passing touchdown record. The Eagles haven’t made the playoffs since 2007. · Central Plains (3-1, 0-0 district) – The Oilers were 3-0 before suffering a 66-28 loss to Victoria. Quarterback Braedan Crites leads the Oilers offense by completing 24 of 44 passes for 551 yards and 10 touchdowns this season. Central Plains fell short of the playoffs last year. · Lincoln (3-1, 0-0 district) – The Leopards have won road games against Lakeside-Downs, Sylvan-Lucas Unified and Pike Valley but fell 50-0 to Hanover. Sophomore quarterback Zac Walter has rushed for 648 yards and 13 touchdowns. He also has been an efficient passer, completing 22 of 31 passes for 289 yards and six touchdowns with only one interception. · Little River (2-2, 0-0 district) – Junior Grant Harvey leads the Redskins in rushing with 471 yards and nine touchdowns on 46 carries. Little River has had a winning record in each of the past three seasons but made the playoffs only in 2011. · Pretty Prairie (2-2, 0-0 district) – The Bulldogs suffered lopsided losses to 3-1 Baileyville B&B and 3-1 Fairfield. Pretty Prairie, which has made the playoffs in each of the past four seasons, has 17 underclassmen on a roster of about 25 players. Kiowa County (4-0, 2-0 district) — Kiowa County has had some talented players and teams the last couple of years, but has not been able to put it all together and has collected records of 6-4, 3-6 and 4-5. This fall, the Mavericks have outscored opponents 230-46 and rank in the top-five in scoring offense and defense. Senior quarterback Trever Powell is maybe eight-man’s best player. He has completed 4 of 9 passes for 90 yards and a 3/0 TD/INT, rushed 65 times for 878 yards and 13 scores and has picked off four passes. Defensively, the Mavericks have also collected 23.5 tackles for loss. South Central (4-0, 2-0 district) — After three straight 3-6 seasons and a 4-5 record last year, South Central has started strongly and outscored opponents 183-74. The T-Wolves have averaged 359 rushing yards per game. Senior quarterback Stetsen Underwood has completed 13 of 26 passes for 151 yards with a 2/0 TD/INT ratio. He has carried 84 times for 685 yards and 12 scores. Fairfield (3-1, 1-1 district) — Fairfield, under former Triplains-Brewster coach Lee Odell, is looking to better last season’s 6-3 record under former coach Chuck Bisbee, now at Russell. Fairfield’s only state playoff appearance came in 1995, when it went 1-1. The Falcons have outscored opponents 216-84, but lost 30-26 to South Central last week. Macksville (1-3, 1-1 district) — One of the state’s more interesting teams, Macksville has played the No. 8-hardest strength of schedule. The Mustangs have one of Kansas’ top players in quarterback Tanner Tranbarger, but have had problems on defense. Macksville lost to Victoria, 58-30, fell to Ness City 50-48, lost to Kiowa County, 70-32, and then beat St. John, 58-36. Tranbarger has thrown for 540 yards and a 7/2 TD/INT ratio and rushed for 578 yards with 12 scores. Pratt-Skyline (2-2, 0-1 district) — Pratt-Skyline has a better record than Macksville, but has played the No. 37-hardest strength of schedule. The Thunderbirds are 2-0 at home, 0-2 on the road. They have mixed wins and losses with a 46-20 loss to South Barber, a 62-36 win against Cunningham, a 38-28 loss to South Central and a 44-38 victory last week against Otis-Bison. Senior Dustin Weber leads the T-Birds with 81 carries for 598 yards and five scores, while senior Cole Patterson has 73 carries for 273 yards and 10 TDs. Pratt-Skyline hasn’t made the playoffs since 1999. St. John (1-3, 0-1 district) — St. John has already lost more games than it did in an 8-2 season in 2012. Opponents have outscored the Tigers 210-116. St. John defeated winless Otis-Bison 64-44 in Week 1, then lost 54-8, 54-8 and 58-36. Schuyler Brown is one of 8-man’s most talented backs. Kinsley (1-3, 0-2 district) — Jeff Chambers has experienced growth with a Kinsley program that hasn’t made the playoffs since 1993. Chambers has won at least four games in all but one of his seasons and has two 5-4 records. This season, the Coyotes have mixed the run and pass effectively. Senior Conner Frame has passed for 565 yards and nine scores, but has completed just 48 percent of his passes with eight interceptions. Three players have rushed between 173 and 365 yards. Key Games: Friday’s matchup between Kiowa County and South Central should decide both spots. Hodgeman County (4-0, 0-0 district) — Hodgeman County has been very successful under fourth-year coach Matt Housman with seasons of 9-2, 5-3 and 8-3. This season, the Longhorns have outscored opponents 188-38 and beaten teams 64-18, 52-6, 46-0 and 26-14. Spearville (4-0, 0-0 district) — Coach Matt Fowler has enjoyed a big turnaround with the Lancers. Spearville has outscored opponents 236-88 after seasons of 3-6, 1-8, 0-9 and 5-4 under Fowler. Spearville has rushed for 395 yards a game and 24 rushing touchdowns with sophomore Nathan Stein leading the way with 43 carries for 455 yards and six touchdowns. Deerfield (2-2, 0-0 district) — The Spartans have outscored opponents 104-90 and mixed wins and losses. Deerfield defeated Wichita Word of Life 40-12, lost to Rolla 24-12, beat Moscow 52-6 and then lost to Fowler, 48-0. Deerfield has not made the playoffs since 2008. Satanta (2-2, 0-0 district) — Satanta is 2-0 at home and 0-2 on the road and has nearly matched the Indians’ combined win total in the last four years – 2-7, 0-9, 1-8 and 0-9. Satanta defeated Goodwell (Okla.) 36-8, Moscow 42-0 and then lost to Ingalls 42-36 and Hill City 36-28. Satanta’s only playoff berth since 2000 came in ’04. Minneola (1-3, 0-0 district) — Minneola has already lost more games than last season when it had standout running back Matt McClaren and finished 8-2. Junior Joey Harrington has 70 carries for 396 yards and six rushing TDs. The Wildcats have averaged 151 rushing yards per game. Last season, Minneola averaged 326 rushing yards per game and McClaren rushed for 2,172 yards. South Gray (1-3, 0-0 district) — Coach Aaron Law has struggled some in his first season with the Rebels. South Gray los 34-30 to Ingalls, 48-0 to Kiowa County, then beat Bucklin 52-20 and lost to Rolla 38-6. Key Games: On Friday, Hodgeman County plays host to Spearville in a matchup that should decide the district title. Atwood-Rawlins Co. (4-0, 0-0 district) - Atwood had no seniors and returned its entire team from a 7-2 record last season. The Buffs posted a strong defense last season and have allowed just 22 points, best in Eight-Man, Division I. Senior Dylan Tiemeyer, in his third season as the starting quarterback, has completed 12 of 20 passes for 157 yards with four touchdowns against no interceptions. Four players have at least two rushing touchdowns and three players have between 177 and 236 yards. Atwood has zero turnovers this season and has forced 13 turnovers. Hoxie (3-1, 0-0 district) - Hoxie has three big victories and a 36-28 home loss in a thrilling Week 2 contest against Wallace County. The Indians are 3-0 on the road and 0-1 at home. Senior quarterback Chase Kennedy has posted a strong season with 19 completions in 33 attempts for 199 yards and a 4/1 TD/INT ratio. Kennedy has 53 carries for 322 yards and five scores, while junior Connor Katt has 56 carries for 501 yards and seven TDs. Ness City (2-2, 0-0 district) - Ness City graduated all but one starter from last season’s dominating 13-0 and Eight-Man, Division I championship team. The Eagles opened with a 46-14 victory against Kinsley and a 50-48 victory against Macksville. Then the Eagles followed up with a 42-14 loss to Victoria and a 26-14 loss to Hodgeman County. Ness City has rushed for 286 yards a game. Five players have between 127 and 301 yards and eight players have a rushing touchdown. Hill City (1-3, 0-0 district) - Hill City won for the first time in the two-year Scott Schulz era last week with a 36-28 victory against Satanta. Two of the Ringneck losses have been to quality teams with a 64-18 defeat to Osborne in Week 2 and a 56-22 loss to Northern Valley in Week 3. Quinter (1-3, 0-0 district) - Quinter is 1-0 on the road, but 0-3 on the road. Opponents have outscored the Bulldogs 132-72. After a season-opening 44-8 victory against Golden Plains, Quinter has lost 54-6 to Baileyville B&B, 24-22 to Dighton and 48-0 to Rawlins County in a non-district game last week. WaKeeney-Trego (1-3, 0-0 district) – The Pat Haxton era has started slowly for the Golden Eagles. The lone victory is a 44-18 victory against Stockton in Week 2. Senior Devon Ghumm has passed for 237 yards and rushed for a team-high 320. He also paces the squad with three tackles for loss. Key Games: Hoxie at Rawlins County in Week 9 will decide both spots. Both teams are pretty evenly matched.